I love getting smiled at! I don't care if I'm the one who smiled first or not, it just makes my day. I'm more apt to remember the person who smiled and think positively about them later on! Yet so many, myself included, are hesitant to put themselves out there with a smile! What if the smile isn't returned? Oh no!!! Plus, some "experts" are now saying that smiling is a sexist expectation placed upon women. And who wants to have unneeded expectations? We have enough on our plates. 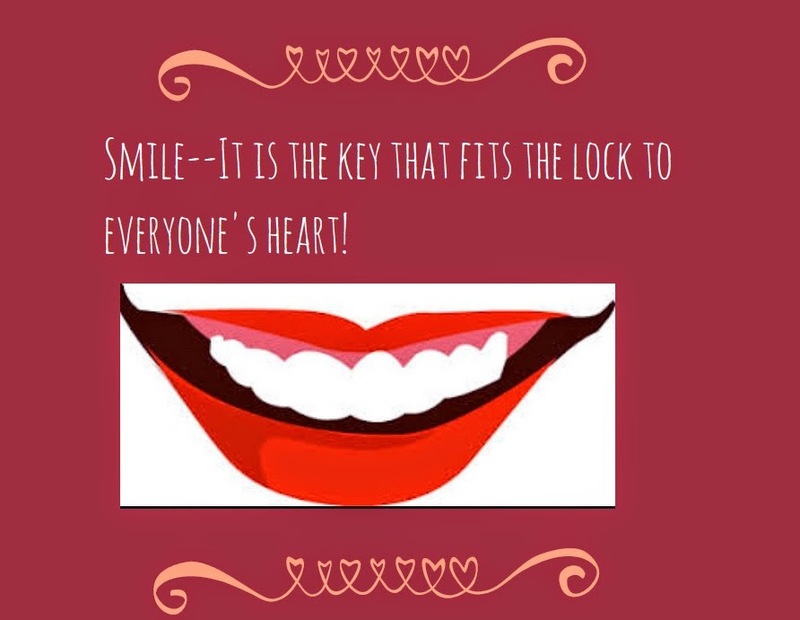 But I say smiling has incredible value, whether it is your health, relationships or job satisfaction. I had a high-school friend who seemed to be everyone's friend. Everyone just liked her! Yes, she was very, very smart, a straight-A student. And she had a great family. She had a stay-at-home mom who was amazing and her dad was a California Congressman, who came home most weekends to be with the family. She didn't kill with sarcasm or funny one-liners. She wasn't particularly gorgeous--other than her mega-watt smile that she wasn't stingy with. She smiled almost non-stop. And there was a sincerity about it. I know that I was captivated by it! I tried to emulate her, because I saw that she had charisma and influence on others. And I, among others, wanted to be around her all the time. More recently, I saw the true value of a genuine smile at work. I work at an alternative high school. A former student was a boy in our special education self-contained unit. He walked with an unsteady gait, couldn't speak very clearly, had some behavioral issues, lived in state custody, but oh, his smile! He used it everywhere he went and people responded so kindly. I daresay he was the most loved kid in the school because he gave away his smile freely, without price! I'll never forget him. These two experiences are interesting because they represent two totally different backgrounds and genders. One was relatively privileged and the other was what most would consider under-privileged. But they both had considerable influence within their own circles. Another thing is that this influence happened because of cumulative effect. They didn't just smile once in awhile. They smiled almost perpetually. And both individuals had smiles that were sincere and unforced. 2) Releases Endorphins - With more endorphins in our bodies, we are able to reduce stress, lessen pain and elevate our moods! In other words, we become easier to live with! 3) Smiling increases productivity while working. It makes sense, because mood is elevated and stress is reduced. We are more in the mood to be productive! 4) When we smile genuinely, people are more apt to trust us! Relationships thrive on smiles! 5) When you smile at someone, at least 50% of people will smile back and thus, it is contagious, spreading the benefits to those around us! I think that there is an art to smiling. I think that practice definitely makes perfect. Experimentation is definitely time well spent! People can tell if a smile is real or fake. Real wins out every time. I believe that the eyes also need to be involved in a truly sincere smile. I've seen people who smile with their lips only, but their eyes look dead. I've also noticed, too, that when my teeth are whitest, my smile is returned by others more often. So go ahead, smile and make someone's day. And don't worry if they don't smile back! You're the one that's the winner anyway! I love this post. Only because I gave away smiles a lot when I was growing up. I use to go around making others smile with me. I've gotten away from smiling since I became a mother, and I really need to get back into it. Andi, I'd count that as good advice you're getting! Crystal, believe me, this post also served as a reminder for me! Such a little thing, with a huge amount of pay-out! 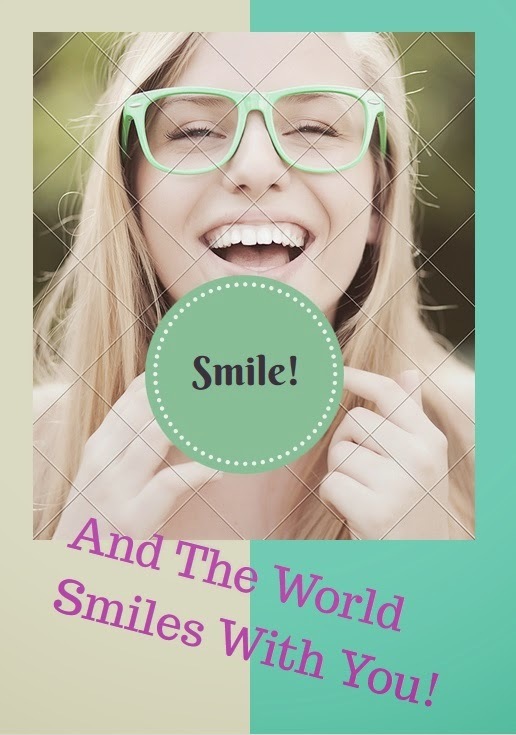 Brilliant article -- smiles are free and SHOULD be passed on! On fact, I'm sharing the post! I love giving away smiles. The smile I get back is priceless. I have heard on more than one occasion that smiling is scientifically proven to help you live a longer life, and I have got to believe that is true!